A view of a port in Qingdao, in China's eastern Shandong province, on March 8, 2019. 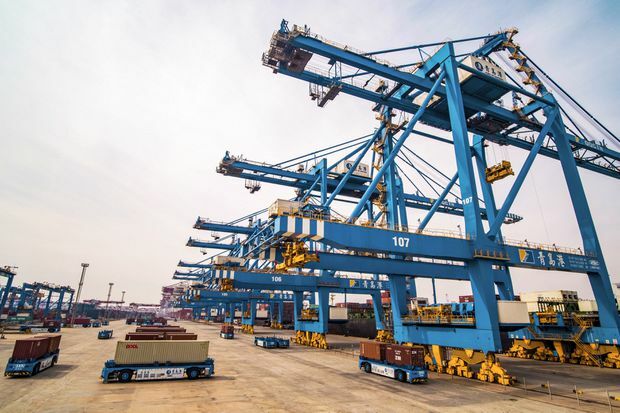 China’s exports tumbled the most in three years in February while imports fell for a third straight month, pointing to a further slowdown in the economy and stirring talk of a “trade recession,” despite a spate of support measures. Asian stock markets and U.S. futures extended losses after the data. Chinese stocks sank more than 4 per cent in their worst day in five months. Global investors and China’s major trading partners are closely watching Beijing’s policy reactions as economic growth cools from last year’s 28-year low. But the government has vowed it will not resort to the sort of massive stimulus it has used in the past, which helped revive demand worldwide. February exports fell 20.7 per cent from a year earlier, the largest decline since February, 2016, customs data showed. Economists polled by Reuters had expected a 4.8 per cent drop after January’s unexpected 9.1 per cent jump. That left the country with a trade surplus of US$4.12-billion for the month, much smaller than forecasts of US$26.38-billion. Analysts warn that data from China in the first two months of the year should be read with caution due to business disruptions caused by the long Lunar New Year holidays, which came in mid-February in 2018 but started on Feb. 4 this year. But many China watchers had expected a weak start to the year as factory surveys showed dwindling domestic and export orders and the Sino-U.S. trade war dragged on. “Seasonal distortions around the Chinese New Year holiday has added noise to the export data in the past two months, and in our view explain most of the surprise (relative to consensus},” wrote analysts at Goldman Sachs, whose estimate for a 20-per-cent export drop was the most pessimistic in the Reuters poll. On Wednesday, the United States reported its goods trade deficit with China surged to an all-time high last year, underlining one of the key sticking points. China’s data on Friday showed its surplus with the United States narrowed to US$14.72-billion in February from US$27.3-billion in January, and it has promised to buy more U.S. goods such as agricultural products as part of the trade discussions. U.S President Donald Trump said on Wednesday that trade talks were moving along well and predicted either a “good deal” or no deal between the world’s two largest economies. Mr. Trump postponed a sharp U.S. tariff hike slated for early March as the talks progressed, but both Washington and Beijing have kept previous duties in place. The government is targeting economic growth of 6.0 to 6.5 per cent in 2019, Premier Li Keqiang said at Tuesday’s opening of the annual meeting of the National People’s Congress, a lower target than set for 2018. Actual growth last year slowed to 6.6 per cent, and is expected to cool further to 6.2 per cent this year. Many analysts expect a rocky first half before a flurry of stimulus measures start to stabilize activity around mid-year. China’s slowdown and the trade war are having an increasing impact on other trade-reliant countries and businesses worldwide. Imports from Japan sank 19.3 per cent in February compared with a month earlier, Chinese customs data showed. On Thursday, automotive chip maker Renesas Electronics Corp. said it plans to halt production at six plants in Japan for up to two months this year as it braces for a further slowdown in Chinese demand. Taiwan reported its biggest export drop in over 2-1/2 years on Friday, with shipments to China down 10.4 per cent. As with China, Japan and South Korea, its hi-tech manufacturers are also being hurt by a global downturn in demand for electronics from memory chips to smartphones. China promises ‘all necessary measures’ to defend companies abroad amid legal clashes between Huawei, U.S.